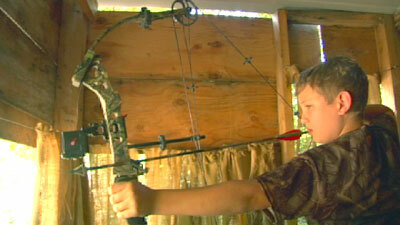 As soon as we were back from lunch Patrick was out shooting his Bowtech Miranda. He was shooting excellent, as usual, and was ready. But he had a request which I didn’t quite know how to answer. He wanted to be alone with me in the blind. He claimed it was because the blind was cramped, but I could tell he was nervous for a host of reasons. Matthew didn’t mind. He was out looking for snakes, scorpions and arrowheads. But my wife Julie was disappointed. We talked it over with Pat and she could also tell the little guy was putting a lot of pressure on himself. So we agreed it would just be he and I in the blind. As Pat Jr. was putting his camo on, Julie shot and Matt was flipping over rocks looking for scorpions. The boy is fascinated by anything that can bite, string or spray at you. Well, on his last rock he got more than he bargained for as he jumped back and yelled rattlesnake! We dropped what we were doing to head over to Matt who was standing by the Shiloh cook cabin. Patrick ran out of our cabin too, after hearing the commotion. I spotted it and told Matt it was not a rattlesnake. 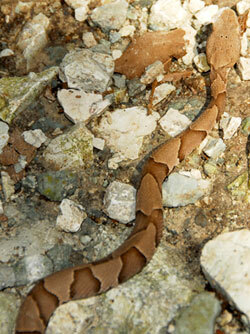 It was a copperhead. The snake was small, about 10” but still venomous. My family got pretty upset with me as I proceeded to pick it up behind the head. The snake did not like that one bit. After my kids took a couple of photos, I flicked the snake back down into the driveway and I believe that was the last of Matt’s scorpion quests – at least for the next hour anyway. Pat and I reached the blind around 3PM. It was extremely hot. The index was around 96degrees between the temp and the humidity. It was hard to believe the hogs would move much until later and that’s pretty much how it went. We sat in the blind a long time as the sun began to lower and illuminate the inside of the blind. Patrick was concerned that nothing would come in. And if they did, he was worried they may see us with the sun. So I closed the burlap curtains more than normal to reduce that opportunity. 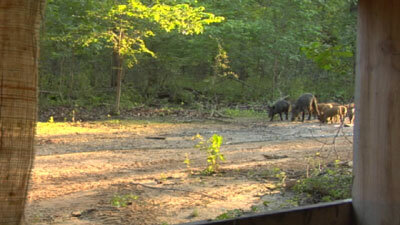 At 7:00 PM, some hogs made their way down the road toward us. I told Pat to get ready. As the hogs came into view I could hear my son breathing hard and deep. I don’t remember noticing this two years ago. He was really anxious, but not to the point where I felt he was out of control. Just excited and full of adrenaline. The hogs never gave him a shot and he sat back down into the chair. I asked him if he was nervous and he said yes, but I don’t realize how loud he was breathing. For whatever reason, I think this hunt meant more to him than his first hunt. I don’t think he quite knew what to expect when he was 9. Now he’s feeling a competition with himself to do as well as he did last year. Another forty minutes passed by when the next group of hogs appeared in view. They fed in and Patrick readied his bow. The first hog was jet black followed by a spotted brown hog. I told him to shoot when he was ready. 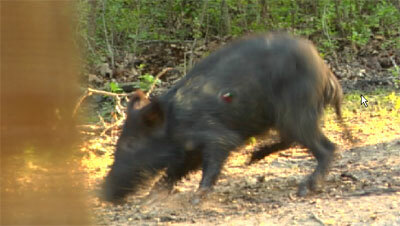 As I followed the first hog with my video camera I could see that Pat was waiting for a good angle. That was good. But the hog was moving and the video was soon to be blocked by the curtain. I hated to mess him up but I needed to move the camera. I tilted the tripod toward Patrick and zoomed in just in time to film Pat bury his second arrow deep into the black hogs’ chest. I turned to my oldest and said – “You did it Patrick!” And for the second time in one day I was the proudest dad in the country! Patrick was shaking and full of adrenaline. He knew his shot was a good one and so did I. We called Matt and Cheryl, along with Julie and his brother down to the blind. The blood trail was very good. The Muzzy 4-blade had passed completely thru the hog and was slick with bright red blood. The hog ran through a swamp and down toward the end of the road. A few moments later Pat was posing with his second hog. I knew he would do it right and we were all extremely proud of him. Now all eyes turned to Julie. The boys are done. Now let’s see if the adults can do as well as their kids…. 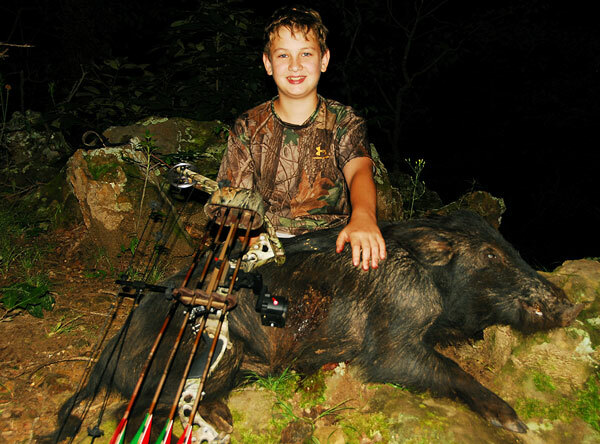 Please join me in congratulating 11 year-old Pat Lefemine Jr. on his 2nd shot and 2nd big game animal!